Attack of the killer Pumpkins!! Is he going to be ok?? Yeah,,Sure it was just a GUT reaction to a Squashed Dream…. In the parody movie “Holiday Movie”, Michael Myers is played by Mike Myers. The Pumpkin Seed of Chucky. You shoulda seen what that thing did to the trick or treaters. Tired of the Abominable Snowman getting all the holiday monster credit, Steve the Pumpkin Monster resorts to Cannibalism. After that, the kids stayed off Old Man Jenkins’ lawn. Jack O’Lantern just couldn’t handle hard cider. Pumpkin Patch Kids development did not go so well. No! No! I told you not to drink the pumpkin cider when your candle is lit! Two anthropomorphised Halloween pumkin men enter, one anthropomorphised Halloween pumpkin man leaves! Jack was horrified to learn it was only a kid dressed as a pinata. All that work and no candy. Against the Great Pumpkin, upstart Jack Skellington never really had a chance. Neighbor 2: They aren’t yours anymore! The way-off-Broadway production of “The Phantom of the Pumpkin Patch” was way off. It was no surprise to the O’Lantern family that Fred would some day take his brother’s life in a jealous rage. Hey Bill? Your new skull just arrived from… Bill? BILL! AAAAA!!!!!!! No i Just think he doesn’t like skull food. Stop comparing me to Frosty Dad! I have feelings too! 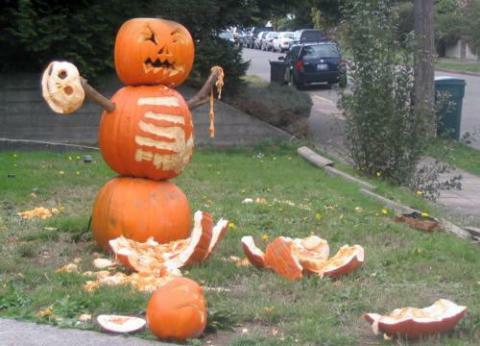 In Soviet Korea… PUMPKINS SMASH YOU!!! Next Thanksgiving, only apple pie will be served at Stephen King’s house. I warned you NOT to call me Gourd-o again! This is why people don’t give jack-o-lanterns bodies. i come home from working all day to put food on the table and you only have one job!!! one f*cking job!!!! MWAHA! I AM THE PUMPKINATOR! Tim Burton’s remake of Pulp Fiction. Dr Pumpkin lost his cool, and most of a limb during a prostate exam. That’ll teach those teenagers to mess with me! Who ever heard of a nija pumpkin anyway? you wanna piece of me!!! Make me into pie will you! For the last time STOP CALLING ME A GOURD!!! I don’t care if you didn’t know she was a gord, I LOVE MY MOTHER! Coming Soon to a theater near you! Linus vs. the Great Pumpkin! Hey, it keeps the Jehovah Witnesses at bay. And now you have learned the power of the Mongols! The budget for the Halloween franchise isn’t as generous as it used to be. Arghh you shot me! You shot me right in the arm! looks like the old kid in the block, after winning he is crying because he got heart! Now ya done went and pissed him off. TAKE MY CANDY WILL YA?!?!?!?!?! I told them not to call me “punkin'” any more! screw you people!!! Oh yeah,…. it was funny last year, a month after halloween when my head collapsed and my damn head caved in! WARNING: This show contains blood, gore, and graphic violence. A typical Christmas day in the suburbs of Liverpool.